There are 60 reviews of Ice*Men. I didn't think there'd be anything interesting with "Ice*Men", after having experienced the majority of the "A*Men" series of flankers. But I was wrong. I love nutmeg. The presence of it in Ice*Men draws me instantly to it, with its shimmering spiciness. Patchouli is the center-piece of this scent, pairing up nicely with the nutmeg. Though unlisted, there is a minty, cool freshness evident within, thus the "Ice" moniker. Down the road, the patchouli with traces of musk are all that really remain of this scent, and those last a bit. It's quite similar in character as Kryptomint and Pure Shot, both which appear to try and improve upon what Ice*Men was supposed to masterfully do. It's not a revolutionary flanker to A*Men, but the dna is there and it achieves a cooling effect for a moment that is enjoyable. Beyond that, I know of many other patchouli-based fragrances that last longer and smell truer to the dynamic possibly aimed for in Ice*Men. Ice*Men starts off smelling sweet, soapy, and citrus in the opening. I can smell the amen DNA, that "sweaty guy" smell. Into the drydown, it's more cool, light and airy, almost like menthol. Definitely casual, probably for warmer weather. Projection is good for about 3-4 hours. Then the scent hangs on for a few hours afterwards for decent longevity. Ice Men is a really decent, almost nice sort of “fresh” and heavily synthetic patchouli with a dusty amber-musk base, quite similar to the ultra-cheap Patchouly Leaves by Monotheme – just with a bit more weight and richness (but less discreet class and brightness). It is a fun take on patchouli, which smells basically emptied from any “dark” earthiness and sweetness, while its leafy-dusty side gets enhanced in a peculiar sort of “cold-metallic” blend. Both musk and a sort of greenish “bamboo” note similar to the one in O pour Homme by Lancome help in rounding this breezy, half-exotic half-industrial ambiance. It may seem something “creative” but for me isn’t anything special, as if you view it from another point of view it smells basically just like a really cheap and plastic patchouli with some musky greenness underneath. Loud and extremely linear as many other Mugler’s fragrances. Still I wouldn’t say it is a bad scent, if you’re into patchouli and you want to smell some different take on it, here you go. 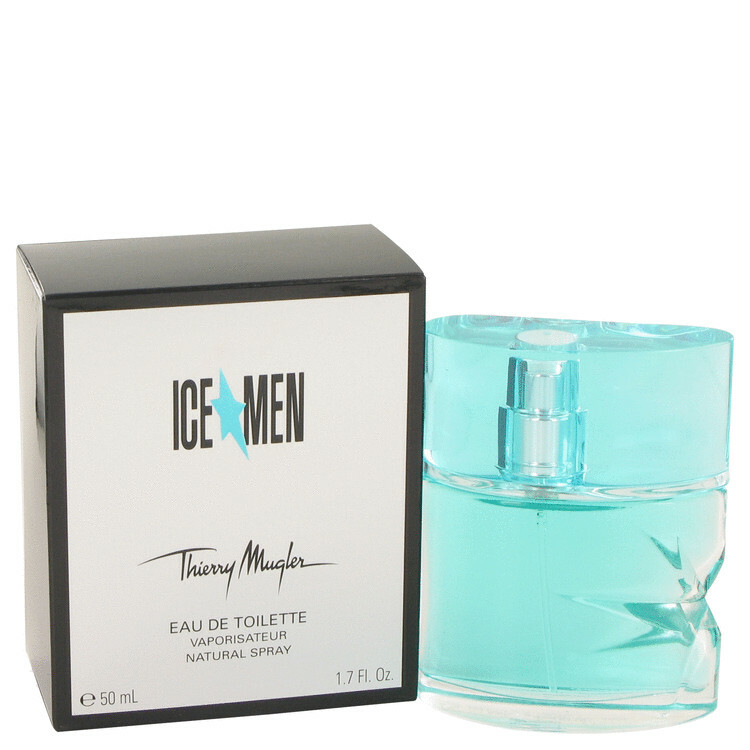 Every ELEGANT man can enjoying of THIERRY MUGLER colognes and ICE MEN?obviously MASCULINE.this one is Different and pleasant for me. Strong opining with patchouli and alcohol,reminiscent of lime for me.when mixed with my skin chemistry,it is really CLEAN and COLD.in my opinion it is different from most of the other cold fragrances. Cool bottle.perfect for hot days and suitable for a businessman.LONGEVITY?was average on my skin.Anyway if you are a free spirit,independent man You need ICE MEN. Holy Patchouli, Batman! Sweaty, head shop patchouli is not what I expected from a blue liquid with “Ice” on the label, but that’s exactly what you get when you spray on Mugler’s Ice*Men. The patchouli comes on strong and says that way, as it is prone to do. The treatment here emphasizes the crisp, minty-herbaceous aspect of patchouli leaves, but the patchouli used is also very sharp and acidic, and the overall result seems crude to my nose. As the hours take their toll on the patchouli there emerges a cool, fresh, camphoraceous woody accord. This is more in line with expectations set by Ice*Men’s name and packaging, but hardly noteworthy in and of itself. The patchouli and woods run the rest of their course side by side, without taking any interesting turns. Kudos, I suppose, to Mugler for not releasing another stereotypical aquatic “sport scent,” but straightforward patchouli is a crowded field, and Ice*Men would have to do more to hold my attention. The opening is really strange. fresh with cooling vibe. so named correctly. The cooling vibe isn't like something you get from fresh mint or pepper mint for example. Smell like a cold and wet basement!! Yeah, that's the patchouli note which give us this feeling. I can smell the original vibe in the background too, but it's not warm or too sweet at all. but definitely you can feel the original in this fragrance. In the mid the patchouli note settle down just a bit and you can smell huge dose of nutmeg and some woodsy notes. specially nutmeg. it's really strong and give you a peppery and sharp smell. Good projection and longevity with this fragrance. Very different and unique fresh fragrance for spring and summer. There are no member images of Ice*Men yet. Why not be the first?